Persons who can afford to file late return? Every assessee whose total income before claiming deductions exceeds the basic exemption limit is required to file income tax return irrespective of the quantum of tax liability. But People tends to miss due date of filing tax return due to lack of time or no planning. Section 139(1) of the Income Tax Act, 1961 specifies the time limit of filing the income tax return for every assessee whose total income exceeds a specified income threshold. Tax returns filed after the specified due date are considered as belated tax returns which could be filed within two years from the end of the relevant financial year under section 139(4) of the Act. After that it becomes time-barred, that is, cannot be filed. Further, penalty is not levied if the tax return is filed within one year from the end of the relevant Financial Year. For example Belated Return for the financial year ended 31st March, 2015 can be filed up to 31st March, 2017 but to avoid penalty the same should be filed by 31st March, 2016. Where assessee has already paid the tax in form of TDS, Advance Tax and self-assessment tax, then the tax return can be filed up to the end of assessment year without any penalty but if filed after the end of assessment year then penalty of Rs.5,000 u/s 271F, will be levied. For example tax return of assessment year 2015-16 must be filed up to 7th September, 2015 (due date revised twice for individual assessee) but if no tax liability is pending then ITR can be filed up to the end the assessment year i.e. 31st March, 2016. In case assessee also failed to file ITR up to this date then by paying penalty of Rs.5,000, assessee can file ITR up to one year from the end of assessment year i.e. 31st March, 2017. Penalty in this case is on discretion of Assessing Officer. Sometimes assessee forgets to consider few incomes such as income from second house property lying vacant or if he had worked under couple of employers but forget to disclose the salary from past employers, thus owes taxes to the Government. The return filing date without penalty of Rs.5,000 remains same i.e. till the end of assessment year but?interest of 1% shall be levied on the amount of unpaid tax u/s 234. Suppose Mr. Sanyam files the tax return on 15th, December 2015 i.e. before the end of assessment year but after the due date, he would be liable to pay simple interest on tax unpaid for 4 months (from September to December) but no penalty. Suppose Mr. Sanyam files the tax return after the end of the assessment year on 10th August, 2016 (i.e. after 31st March, 2016). In this case, he will liable to a penalty of Rs. 5,000 u/s 271F along with the penalty of 1% on balance tax payable for 12 months (September, 2015 to August, 2016). In case you have paid excess tax and have tax refundable then you can file the return even after 31st July of the assessment year without any issue. The only disadvantage will be that your refund will be processed late and you will get your money late. The procedure of filing belated return u/s 139(4) is similar to filing original return u/s 139(1). However, assessee should clearly state that the return is belated return by selecting Belated Return in ITR Form as shown below. This is applicable for both online as well as for offline ITR forms. A belated return cannot be revised. Unlike a return filed within the original time limit, which can be revised n number of times within a specified period. For example, you have spent Rs.10,000 on the preventive health check-up for yourself but did not claim it while filing ITR as you were not aware about the deduction up to Rs.5,000 under CGHS (Central Government Health Scheme) for the amount spent on preventive health check-ups or you discover any omission or misstatement in the original tax return filed. Had you filed your original tax return within due date you could have filed the revised return to claim the deduction of Rs.5,000 within two years from the end of the relevant financial year or before completion of your assessment by the tax officer, whichever is earlier. Another loss of not filing the tax return within the due date is that your eligibility of carrying forward the losses of the current financial year to next financial year gets lapsed as per section 80 of the Income Tax Act. ?For example you have made losses in share market which could be set-off from the gains of next financial year but since you have filed belated return us/ 139(4) instead of filing the original tax return within time, you cannot carry forward this loss and thus loses the benefit of set off of these losses against the income of next year. However, there are few exceptions to this rule i.e. this rule is not applicable on the losses from house property and business loss on account of unabsorbed depreciation and capital expenditure on scientific research. That means losses from house property and business loss due to unabsorbed depreciation and capital expenditure on scientific research can be carried forward even if the tax return is filed after due date. After deducting advance taxes, TDS and self-assessment tax if any tax remains unpaid than the interest u/s 234A will be applicable @ 1% per month and part thereof up to the date of filing of the return on the amount of outstanding tax. This interest is in addition to the interest u/s 234B or 234C and will be levied only if there is any tax payable in your return. This is in addition to the 1% per month interest for non-payment of advance tax, that is, tax due after tax deduction at source exceeding Rs.10,000. Thus, late returns can result in an additional interest burden. Section 271F gives power to tax officer to levy a penalty of Rs.5,000 on the assessee for filing tax return after one year from the end of the relevant financial year. For example, there will be no penalty if the ITR for financial year ended 31 March 2015 is filed by 31 March 2016. If it is filed after that, the tax officer can levy this penalty. However, this provision is discretionary and rarely exercised by the assessing officer. You are eligible to get tax refunds irrespective of the date of filing the tax return. Usually, the earlier you file the return, the earlier you receive the refund. Late filing of return delays refund. Further, interest on refund u/s 244, wherever applicable, is also reduced to an extent if the return is filed late. I have filed ITR every year since 2012-13 onwards. My Auditor was doing it for me as I was not familiar with this. Was a NRI. Somehow missed out to file the ITR for the assessment year of 2015-16. But the done it for 2016-17. Whether I can do the filing with penalty or whether we can ignore. Please help. I don’t want to be a defaulter. Sir, I have missed to file my IT Return for the assessment years 2014-15, 2015-16 and I filed ay 2016-17… Is it possible to file return for ay 2014-15 and 2015-16? Sir I filed ITR for asst. year 2015-16 on 31-03-2017 for my PAN No. AAFHS0656F on a friends computor myself. The file was deleted by my friend on his computor. I was suppose to send the declaration within 120 days duly signed. But now I have no details of the acknowledgement. So what should I do. Don’t worry.. Just login into year Income tax account using https://incometaxindiaefiling.gov.in and you can avail details of your filed returns.. I had filed my income tax return for AY 2016-17 within time limit i.e. before 31st July, 2016. However, I did not do e-verification and even did not send the copy to Bangalore CPC office. Now, I am trying to file the return again as Original under sec 139 (4). But I get a message that “Only One Original ITR can be filed under sec 139 (4). Please change the section”. You can do revised return and post the hard copy to cpc. Please someone advice if I can claim some refunds ? Hi, For AY 14-15 I’ve mistakenly uploaded return of 15-16. During the AY 14-15, I was not in country for complete FY 13-14 and was in deputation overseas. There were no tax liability for me for AY 14-15. 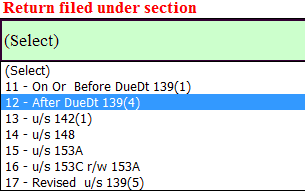 When I try to resubmit via “After due date 139(4)” ITR doesn’t allow me. Can you please contemplate as how can this scenario be fixed. I tried filing my all years ITR now as I realised its easy and good practise and I am about to get many refunds for all past years being an NSC agent. While trying to submit for year 2013-14, The end date for filling this ITR is over is shown and not allowed to submit. I understand later that only 2 years time we have to submit. Any suggestions to claim previous refunds? Plz help.. its almost around 25000/- which is big amount for me. Your explanations are really clear. I have one query though. For the FY 2015-16, I filed ITR after 31st March 2016. Moreover, I had tax payable. I understand that I may be fined with Rs. 5000 for this. The problem is in the form I did no mention of the balance tax paid by me. Don’t worry .Income tax department always send you Sms but here your income is not exiting for taxable as per A.Y slab so it is depend yourselves .but i suggest you . you file return for future benefit then you can take refund after deduction by someone. but now i would like to fill itr of 2013-14….when i clicked on submit option…….this sentence appears (The end date for filing this ITR is over. ).